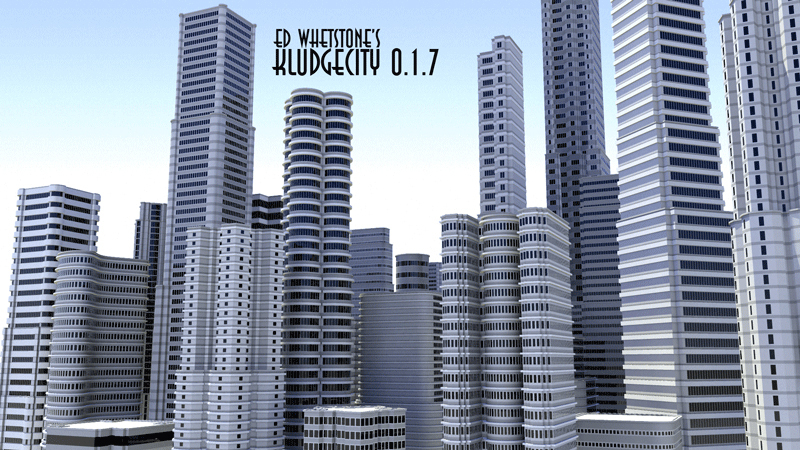 Kludge city is a procedural building and skyscraper generator being developed by Visual Effects Artist, Ed Whetstone, as part of his short film project, "The Deliverator". It is open-source, and freely available for anyone to use or edit, so head on over to www.whetstonevfx.com and download it now! KludgeCity requires Maya 2009 and above. Each new version will be updated below. In order to install KludgeCity, simply right-click the link below, and save the EdW_KludgeCity.mel file to your maya scripts directory. This is usually located in My Documents > Maya > Maya (Version) > Scripts. If you have Maya open, restart Maya. Then, type the following code into the Script Editor. To download older versions of the tool, go to www.whetstonevfx.com/kludgecity.html. KludgeCity is a procedural system for generating buildings -- you only need one piece of geometry built in order to get started -- something I refer to as a "footprint". Once you create a footprint and load it into the system, simply change the variables in the KludgeArchitect rollouts, and press the Execute button. The building will be generated wherever the footprint is located in your scene, using whatever units you have set up in Maya. Currently, KludgeCity is still very easy to break, so you must follow a couple of rules when creating your footprints. For complete tutorial instructions on how to use Kludge, go to www.whetstonevfx.com/kludgecity_tutorial.html.